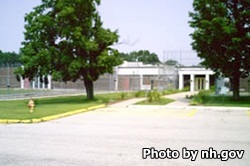 New Hampshire State Prison for Women is located in Goffstown. It houses minimum, medium, maximum and close custody females who have been sentenced by the state to serve a prison sentence. The current capacity of this facility is 105 inmates. While incarcerated here inmates can take High school classes, and earn a GED. Additionally, offenders can receive substance abuse and mental health treatments. Parenting courses help teach offenders the importance parenthood. In order to visit an inmate at the New Hampshire State Prison for Women you need to have an approved visiting application on file. View the visiting schedule in .pdf format here.